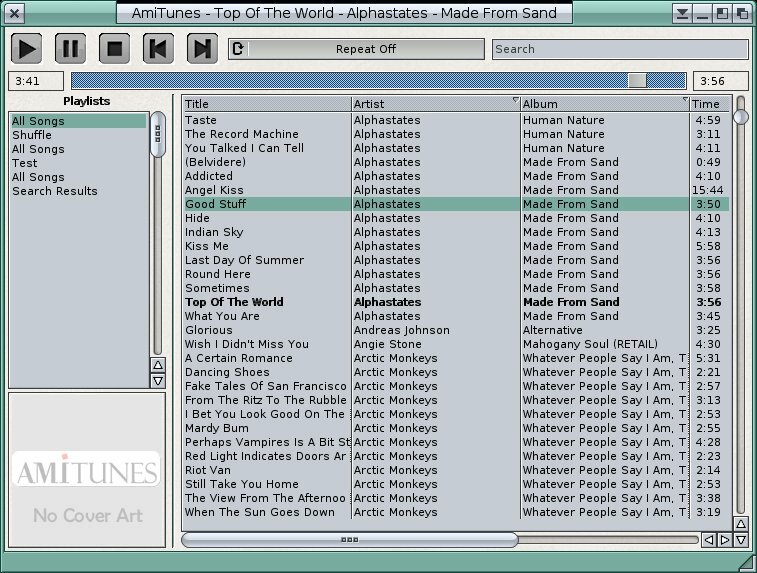 A ground-up rewrite of my AmiTunes-Jukebox music library software which was mainly for use in an A1200-based MP3 jukebox. It was designed for classics with a MAS player, and supports use by remote control / buttons without using a monitor or TV. This new version is for higher-end Amigas and compatibles. It uses an MUI interface and is intended as a music library package, based loosely on the ideas in iTunes, Beatbox and so on. It supports multiple playlists, a shuffle playlist (like itunes DJ), reading/writing ID3 tags, organising files by artist/album/title and so on. Playing playlists continue to play in the background while other playlists are edited, and search results are added to another playlist which is saved. So far it's nice and responsive on OS4, and loads in a couple of seconds with a library of about 1,500 songs. More songs of course will slow it down further, but it's not so bad, as once it's loaded, access to any song in the library is nearly instant. Still in Alpha, but I'm hoping to be able to release a beta version soon.